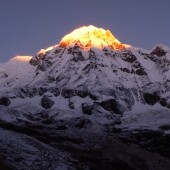 Annapurna Circuit (Round) and Annapurna Base Camp Combined Trek is located in the Annapurna region. 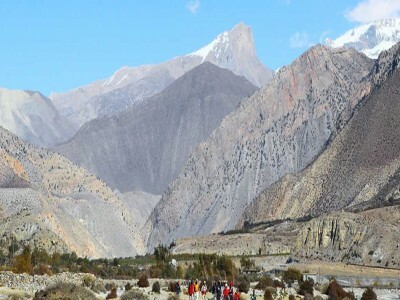 Annapurna Circuit Trek is recognized as one of the world's best trekking routes where the trekkers will have a great opportunity to explore the beautiful views of hills and Himalayas. This trekking provides the visitors with an opportunity to explore many different ethnic groups, their culture and traditions. The Trek starts after a 6-hour drive from Kathmandu to Besisahar (860m/2690ft) and then to Bhulbhule. 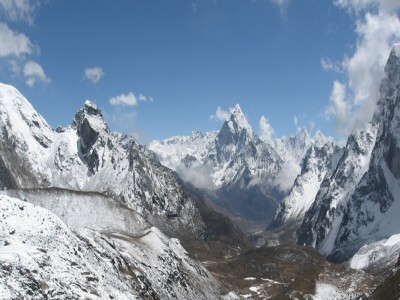 Throng-La Pass is the highest pass in this trekking with the elevation of (5400m/17716ft). After walking past the Thorong-La Pass the trail goes up to the Mukinath, one of the holiest temples of both Hindus and Buddhists. There are altogether 108 waterspouts (Dhara) called “Muktidhara” and two water ponds called Kunda. 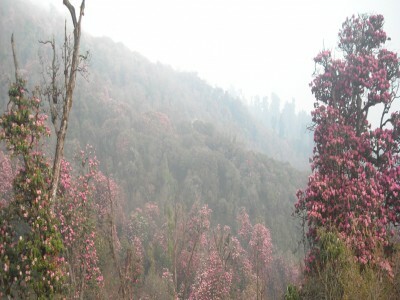 After the Muktinath the treks pass the red rhododendron forest fully bloomed in late February to starting of May. In Tadapani there is natural hot spring water, trekkers can enjoy the bath. The Poone hill at Ghorepani is a best place to view the amazing scenery of Annapurna and Dhaulagiri Himalayan ranges, both above 8,000m. 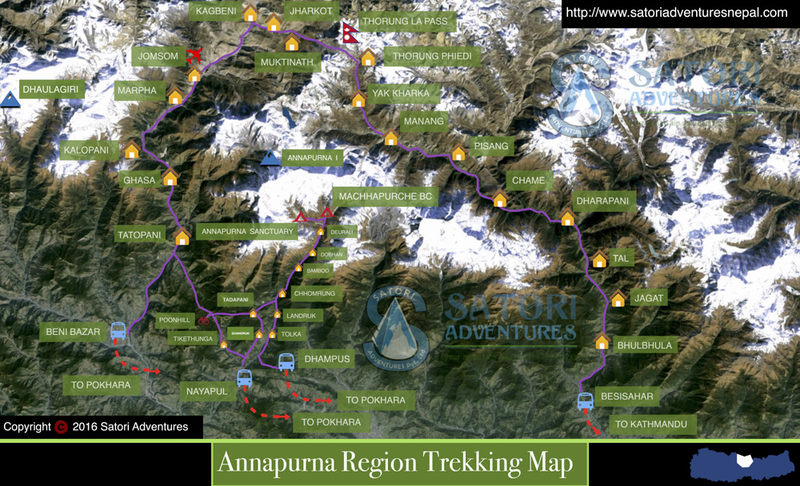 Now, the trek goes down to the Annapurna Base Camp. 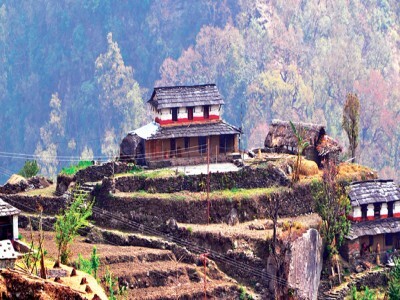 This Annapurna Circuit and ABC Combines Trek is usually a 26-day itinerary. 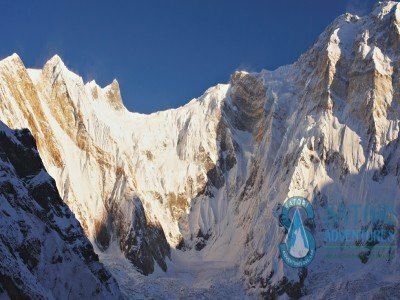 However, Satori Adventures designs the itinerary and trekking package as per your desire, time and interests. 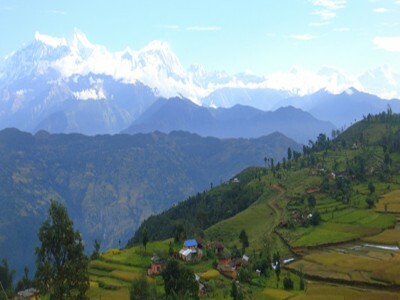 We combine your trip to the Annapurna Circuit Trekking and the Annapurna Base Camp Trekking along with the historical and cultural valley tour in Kathmandu and Pokhara as well. The best seasons for this trekking are the spring (March-May) and the autumn (August-November). You can trek through this route throughout the year though. Day 1:Arrival in Kathmandu Airport and transfer to request category hotel accommodation in Kathmandu (1350m/4430ft). Day 2: Drive from Kathmandu to Besisahar (823m/2700ft, 08hrs) overnight at lodge. Day 3: Treks from Beshishahar to Bahundanda (1305m/4281ft, 06hrs) lodge accommodation.Day 4: Treks from Bahundanda to Chamje (1430m/4,692ft, 06hrs) lodge accommodation. 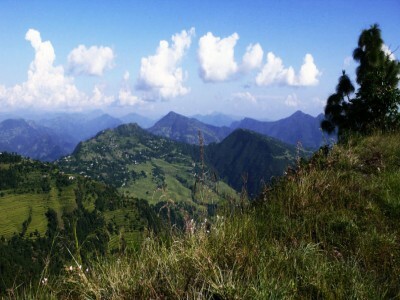 Day 5:Treks from chamje to Dharapani (1860m/6,103ft, 06hrs) lodge accommodation. Day 6: Treks from Dharapani to Chame (2670m/9,055ft, 05-06hrs) lodge accommodation. Day 7:Treks from Chame to Pisang (3100m/10,170ft, 05hrs) lodge accommodation. Day 8: Treks from Pisang to Manang (3440m/11,286ft, 05-06hrs) lodge accommodation. Day 9: Acclimatization Day at Manang (Prepare for passing the Thorong La Pass) lodge accommodation. Day 10:Treks from Manang to Yak Kharka (4350m/14,272ft, 04hrs) lodge accommodation. Day 11:Treks from Yak Kharka to Thorong Phedi (4420m/14,501ft, 04hrs) lodge accommodation. Day 12: Treks from Thorong Phedi to Muktinath (3850m/12,631ft) via Thorong La Pass (5416m/17770ft, 07 hrs) lodge accommodation. Day 13: Treks from Muktinath to Tukuche (2600m/8530ft, 06hrs) Lodge accommodation. Day 14: Trek from Tukuche to Ghasa (2100m/6890ft, 06hrs) Lodge accommodation. Day 15: Trek from Ghasa to Tatopani (2474m/8116ft, 05hrs) Lodge accommodation. Day 16: Trek from Tatopani to Ghorepani (2675m/877,6ft) Lodge accommodation. 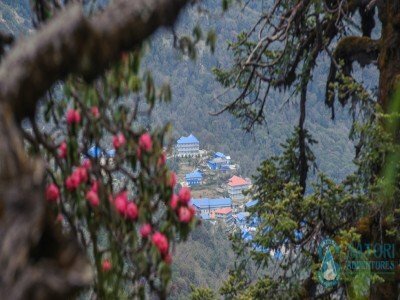 Day 17: Trek from Ghorepani to Poonhill (3180m/10433ft) to Tadapani (2675m/8776ft, 05-06hrs) Early in the morning you will enjoy the sunrise view over Mt. 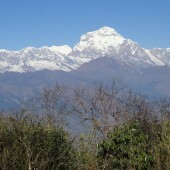 Dhaulagiri, Tukuche peak, Nilgiri, Mt. 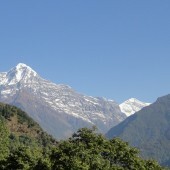 Annapurna and Lamjung Himal from Poonhill lodge accommodation. 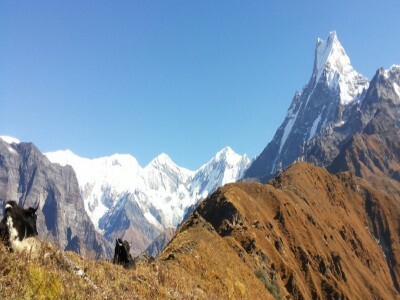 Day 18:Trek from Tadapani to Chhomrong (2040m/6693ft, 05hrs) lodge accommodation.Tadapani (2520m) with 6-7 hours walking where the overnight accommodation with dinner is scheduled. Day 19: Trek from Chhomrong to Bamboo (2340m/7677ft, 06hrs) lodge accommodation. Day 20: Trek from Bamboo to Deurali (3230m/10597ft, 05hrs) lodge accommodation. Day 21:Trek from Deurali to Annapurna Base Camp (4130m/13,550 ft) Via Machapuchere Base Camp (3820m/12533ft, 04 hrs) lodge accommodation. Day 22:Trek from Annapurna Base Camp to Dovan (2630m/8,629ft, 06hrs) lodge accommodation. Day 23: Trek from Dovan to Jhinudanda (1750m/5,741ft, 07hrs) lodge accommodation. Day 24:Trek from Jhinudanda to Nayapul(1050m/3,445ft) takes about 5 hours and then Drive to Pokhara, takes about 45 minutes overnight at request category Hotel accommodation. Day 25:Drive from Pokhara to Kathmandu by tourist bus which takes about seven hours or You can also take a flight which takes about 25 minutes,overnight at request category Hotel accommodation. Farewell dinner with culture program In the Evening. Day 26:Drop to airport for final departure, or alternatively join other programs. 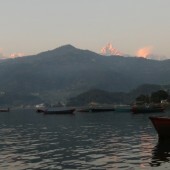 01 night request hotel accommodations in Pokhara on Bed and Breakfast basis. 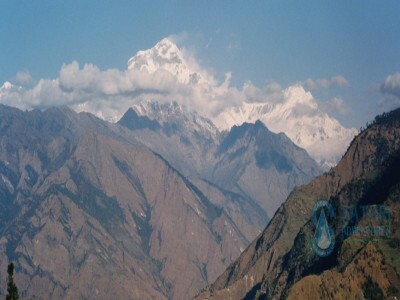 Offer spectacular and majestic view of the white Himalayas.